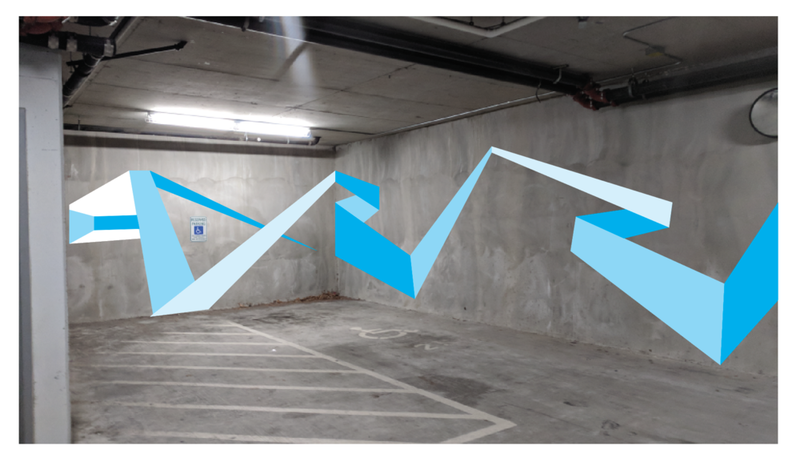 Wayfinder is a visual pathway connecting commuters and visitors from the street to the belly of the museum parking lot, providing pops of color that weave throughout the space, luring the gaze to unexpected, tucked away corners of an otherwise overlooked utilitarian space. The artist prefers this experience as a creative solution to banal, overly predictable navigation strategies that dismiss the awe of interpretation and chance. The work subverts traditional wayfinding by providing meaningless guidance and visual instability. Damien Gilley is an installation artist based in Portland, OR whose work extends the limits of drawing and sculpture in site specific architectural interventions. See Damien's work at the Bellevue Arts Museum.